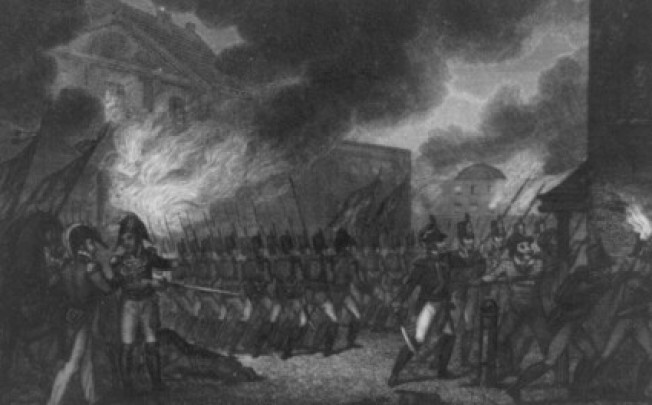 On this day in 1814, the British burned Washington, following the American rout at Bladensburg. While public buildings like the U.S. Capitol and the White House were burned, private buildings were largely spared. You've likely heard the story about first lady Dolley Madisonsaving important documents and a Gilbert Stuart portrait of George Washington—though that might not be totally accurate. One of my favorite stories of the War of 1812 involves the chief clerk of the U.S. Supreme Court, Elias Caldwell, who lived at 206 Pennsylvania Ave. S.E. As the British advanced on the city from Bladensburg, Caldwell moved the Supreme Court's library—the high court was housed in the Capitol—into his own residence, built in 1809. According to James M. Goode's authoritative Capital Losses, Caldwell left "his own valuable personal collection of law books" at the Capitol, which was lost in the fire. So American jurisprudence owes a bit of gratitude to Caldwell's sacrifice nearly 200 years ago. The house, where the Library of Congress' Adams Building now stands, was torn down in 1933. British Burned D.C. 196 Years Ago Today was originally published by Washington City Paper on Aug 24, 2010.